“Four rational people conversing” was how the brilliant writer and poet Johann Wolfgang von Goethe described to a friend in 1829 the genre of the string quartet. By this time in history, the particular ensemble of two violins, viola, and cello had been established for nearly half a century as the preeminent configuration known as chamber music. The broadest designation of the term could be said to go back more than a century earlier, before the early 1720s when Johann Sebastian Bach wrote music for Prince Anhalt at Cöthen. Bach and countless predecessors were most often in the employ of the aristocracy, and most of their compositions fulfilled very practical functions as courtly entertainment, often performed in an intimate setting such as a palace chamber. As the 18th century unfolded, the pianoforte replaced the harpsichord, and the orchestra gradually grew along with new forms such as the symphony and the solo concerto, fostering in the burgeoning middle class an appetite for concert hall performances. However, composers did not abandon chamber music. Rather, they raised it to a level of expression and complexity that soon placed in-home or informal performance beyond the skills of even gifted amateurs. In the arena of the string quartet, Franz Josef Haydn was to blame for this development. Affectionately known as “Papa” to the musicians in his charge at the estate of the Esterhazy family in Hungary, Haydn is widely known as the “father” of the string quartet. Encouraged to experiment and responsible for producing an enormous amount of music, Haydn eventually settled on this unique combination of strings for producing a seemingly inexhaustible trove of musical possibilities. His over fifty collected works in the form are considered a foundational pillar of chamber music, sparking innovative works from both Mozart and the young Beethoven. By the time Goethe penned his famous quote, Beethoven had been dead for two years. During his life Beethoven produced sixteen monumental string quartets, works that not only demanded the skills of top professionals but also cried out for significant public performance. While perhaps Beethoven’s greatest quartets could scarcely compete with orchestral works like the mighty Symphony No. 9, these graceful quartets were more accessible to the average audience and, simultaneously, suitable for a concert hall. So, composers kept writing string quartets, and musicians were easily found to play them. More often than not, orchestral players would gather together and play quartet pieces in order to satisfy a desire for a more intense level of participation, one that lay somewhere between individual contribution and submisssion to the whole, a feeling they rarely experienced in a larger ensemble. But very few tried to make quartet performance a significant part of performance life. The few exceptions were often the result of a famous violinist assembling a group and using his name to generate interest and ticket sales. The only string quartet in history to reach the century milestone began as an everyday event at an average music school: the informal coming together of students to play music. On either side of twenty years old, four students at the Brussels Conservatory in Belgium enjoyed the intimacy of the string quartet, loved new music, and were constantly seeking to play more of it. Without even a name, much less a plan, violinists Alphonse Onnou and Laurent Halleux, violist Germain Prévost, and cellist Fernand Lemaire began to play together in 1912. Before they ever approached a time when they would have to decide whether to continue beyond their days at the Brussels Conservatory, World War I intervened. While they all survived the great conflict, it was Onnou, Prévost and Halleux who found themselves in 1918 playing in a small orchestra sent by the Belgian government to Germany. With the government-sponsored orchestra as a base, they quickly recruited a new cellist, Fernand Quinet, and resumed their passion anew. Isolated by war, German audiences were eager to catch up on contemporary chamber music, and during their travels across Germany the new quartet found itself in new aesthetic territory as well. Prévost recalled, “Imagine! The Germans knew nothing of Ravel or D’Indy, and we were entirely ignorant of new music from Vienna or Budapest.” Prévost insisted that the foursome rehearse every day of the week, and the others agreed. Now that it appeared the group had a foreseeable future, it seemed a good time to choose a name. The first idea was the time-honored (if undemocratic) practice of headlining the first violinist: The Onnou Quartet. But it was Onnou himself who immediately rejected the idea—not so much on the grounds that he often deferred to Prévost in the first chair, but his broader vision for the group. “No, I can die and the group must go on. We have to find a neutral name,” Onnou said. It was a former professor in Brussels who suggested the simple but eloquent Pro Arte, for art in Latin. By 1921 the group once again had a new cellist, Robert Maas; the ensemble had the personnel in place that would last for a generation. That same year the Pro Arte Quartet began a series of concerts that would continue for ten years in Brussels. While they continued their contract to play in the service of the Belgian government for several more years, life was beginning to return to a pre-war normalcy with the opportunity to play far and wide. In cities like Paris and Brussels, that meant cutting-edge music—and an additional level of excitement. The French capital had been the scene of the famous 1913 riot over Stravinsky’s new ballet, Le Sacre du Printemps, when supporters scuffled with detractors at the premiere performance, and apparently Brussels was no stranger to this type of artistic agitation. Paul Collaer, an amateur pianist who was also a critic and historian, approached the quartet with the idea of a festival of, in Prévost’s words, “all modern compositions existing.” Even before what became a ten-year run of “Les Concerts Pro Arte,” the quartet had developed a reputation for committed readings of the most difficult of new works. The festival repertoire included Bartók, Shostakovich, Villa Lobos, Berg and Schönberg to name a few. The festival series grew to ten concerts a year, and other like-minded groups were attracted, such as the Kolisch Quartet, named for their famously left-handed first violinist, Rudolf Kolisch. Those early successes quickly paid off on a grander scale than anyone could imagine. In 1923 the Pro Arte Quartet was invited to Rome by the composer and pianist Alfredo Casella, to perform his Piano Quintet with him. Casella had assumed a prominent role in bringing Italian music out of the opera house and into the 20th century. He was aware of the Pro Arte’s growing reputation for blazing new trails in contemporary music. Casella also had a very important friend who shared his passion for chamber music in general and new music in particular—and she was about to become the Pro Arte Quartet’s biggest fan. Elizabeth Sprague Coolidge was becoming the most famous individual American patron of classical music, but she was no mere well-meaning dilettante: As a young woman, she had lofty musical aspirations and talent that included a substantial pianistic pedigree. Eventually Coolidge got as far as an appearance as guest soloist with the Chicago Symphony. She also worked on composition, but an accident in her twenties left her with a partial but permanent loss of hearing. It wasn’t until her fifties however, following the death of her parents and husband a short time apart, that she turned her full attention—and inheritance—toward what would become her life’s mission: bringing chamber music to the world. Before she was finished, Coolidge knew and corresponded with every major composer and chamber musician of the first half of the 20th century. Alfredo Casella already knew her well in 1923, but even he could not have predicted the results of Coolidge meeting the Pro Arte Quartet. She said later that encountering the Pro Arte Quartet was “love at first hearing,” and her passion for the group was centered on violinist Alphonse Onnou. In him she experienced an artist that mirrored her own aesthetic personality: intellectual, introspective, and completely dedicated to music. It was at her insistence that Onnou became the permanent first violinist of the ensemble. By 1925, Coolidge sponsored a set of concerts for the Pro Arte Quartet in London, and that success led to their first American tour the next year. A lengthy affair—ending with a performance at the White House—the tour marked the first in a series of 33 trans-Atlantic trips (keep in mind, trans-Atlantic trips then took at least four days on an ocean liner). Beginning in 1932, the quartet made regular summer visits to Mills College in Oakland, California, where for eight weeks the Pro Arte would perform twice a week, teach private lessons, and coach student ensembles. The group returned every year through 1940, except for a 1939 excursion to perform at the Belgian Pavilion at the New York World’s Fair. As the 1930s waned, and war clouds again enveloped the European continent, the Pro Arte Quartet seemed to be everywhere: They were almost considered popular musicians after recording a series of Haydn quartets for England’s division of Victor Records, known as His Master’s Voice (readers may recall the company’s logo of a dog cocking his ear at the old Victrola player). The quartet continued to appear at the Library of Congress and on both U.S. coasts, and thoroughly enjoyed the mix of performance and teaching during summers at Mills College. The one thing they hadn’t done was tour the central U.S. But, once again, relationships and circumstances were about to change all of that, and seemingly overnight. By 1938 the University of Wisconsin–Madison had been established some ninety years, but the UW’s School of Music was still evolving. When Charles H. Mills, who directed the School of Music from 1914 until his death in 1937, began the job, there was no four-year degree in music, only a two-year program leading to a certificate. Both a Bachelor and Master degree curriculum were developed, and at Mills’ final commencement in 1937, he escorted his first PhD candidate. Besides building the curriculum, Mills had a vision that expanded far beyond the university’s isthmus campus, one he referred to simply as “the Wisconsin plan.” At the heart of it was a new policy in which music courses had equal standing with academic subjects for entrance to the university. Launched in 1927, this initiative quickly spurred a significant raising of music standards and requirements throughout Wisconsin’s secondary schools, and “the Wisconsin plan” soon became a model emulated in other states. Mills further stimulated this rise in artistic standards with the establishment of a summer music clinic, and an All-State Band, Orchestra, and Chorus for area high school students. Mills’ death in 1937 created the need for a new School of Music chairman, and then-UW President Clarence Dykstra sensed an opportunity to further elevate the caliber of the department and potentially expand its impact in a number of ways. Dykstra appointed Carl Bricken, whose resume included the chairmanship of the music department at the University of Chicago, distinction as a pianist and conductor, and even a Pulitzer Prize for his String Quartet. Bricken not only shared a Chicago connection with Elizabeth Sprague Coolidge, but they shared countless professional relationships. In short order, Coolidge contacted the new chairman, offering to arrange for a pair of concerts at UW–Madison by the Pro Arte Quartet. Bricken was delighted to add the cache of such a high-profile appearance in his first year, but Coolidge might well have already had a larger agenda than simply helping a friend in his new position (and getting another gig for her favorite ensemble). Now 76 years of age, Coolidge had already begun to explore ways to ensure that her true legacy would include a continuation of the Pro Arte’s wide-ranging performances and lasting impact. A Pro Arte Trust Fund had been established, but was a well-kept secret; only lead violinist Onnou was aware of the details. When the Pro Arte performed in the UW–Madison Music Hall on April 11 and 12, 1939, the ensemble wowed musical Madison with a survey of standard fare that left their audiences wanting more. Bricken wasted no time in deepening this new artistic relationship, inviting the Pro Arte at once for a longer, all-Beethoven series the following year. 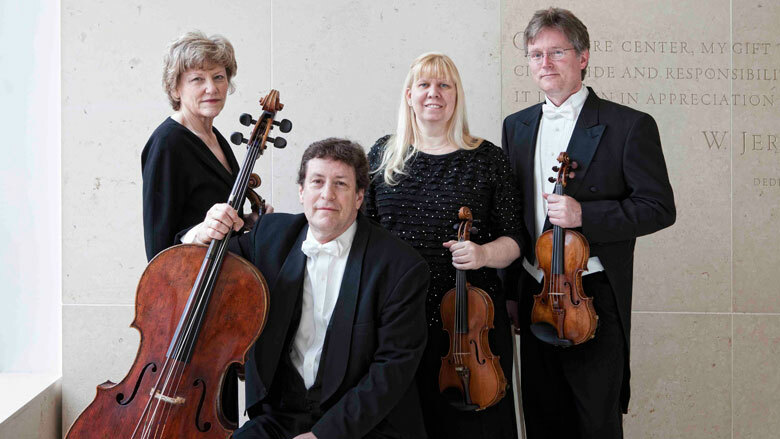 Coolidge upped the ante: The first discussions took place regarding the establishment of a UW residency for the Pro Arte Quartet, an arrangement that had yet to be established anywhere for any type of ensemble. Carl Bricken was all ears. As potentially exciting and momentous as it might be to become the prototype for a new way of doing business and art, the Pro Arte’s day-to-day concerns quickly pushed this possibility to the background. As the quartet’s fall schedule in Europe reached its usual hectic pace, cellist Robert Maas became terribly ill. The first symptom was tenderness in the jaws, and swelling that indicated mumps. Eating became increasingly painful. Even audiences could see Maas’ great discomfort during performances. Eventually he was diagnosed with actinomycosis, a persistent bacterial infection that causes painful sores on the face and neck. By February of 1940, it was time to return to America for another round of tours, but Maas was far from strong enough to attempt the passage. Onnou, Halleux, and Prévost wrestled at length with the decision to leave Maas behind. But with the war escalating to the east, and passage to America growing ever more difficult to obtain—not to mention the necessity of making a living as a quartet—Onnou wired Coolidge with a request to help search for a replacement cellist. She wasted no time in engaging the British cellist, Charles Warwick Evans (living in Hollywood at the time), for 27 concerts. For the first time in two decades, the Pro Arte Quartet would have a change in personnel. May 10, 1940, is the day that changed the history of the Pro Arte Quartet, and indeed, the history of chamber music itself. As the men prepared for their third of six Beethoven concerts at tUW–Madison’s recently completed Union Theater, the Sunday papers relayed the news that Hitler had invaded Belgium. Not only was Maas still there, but the other men’s families as well. During their warm-ups, Clarence Dykstra interrupted the men, and informed them of the announcement he was about to make from the stage. Although nothing has materialized into a firm offer, the events of the past 24 hours have so altered the landscape that I will personally do all that is within my scope to see that this invitation does become a reality and the Pro Arte Quartet will from now on be called the Pro Arte Quartet of the University of Wisconsin. Furthermore, I will do all that is possible to bring the families of the musicians to the United States. Before the month was out, a working agreement was in place to house the quartet at the univeristy. But this pivotal moment in the Pro Arte’s history also marked the beginning of the darkest chapter in its story. The summer of 1940 found the quartet back at Mills College for what would be the final visit there. What had always been a welcome if busy eight weeks unfolded under a cloud of concern for the welfare of the families still in Belgium. While Onnou’s wife, Jeanne, was en route via France, Halleux’s family would not arrive for another year, and Prévost’s wife and two daughters would not make it to America until after the war. In fact, Prévost did not know the vital role his loved ones were playing until he received a letter from the parents of a pilot from Croydon, England, thanking the Prévost family for the kindness they had shown their son after his plane was shot down in Nazi-occupied Belgium. Better still was the news that Prévost’s family was fine, and remained so as they maintained their safe house throughout the war. No, death in time of war did not come to the Pro Arte or to their families on the field of battle. Instead, it struck right here in Madison. No sooner was Onnou reunited with his wife in July, 1940, then he became seriously ill, and was soon diagnosed with leukemia. Coolidge brought in Dr. George Minot, a Nobel Prize-winning scientist and expert in blood disease, from Boston in the hope of treating the stricken violinist. In November as Onnou was dying, the other quartet members quietly conferred at his bedside, debating how to best keep the Pro Arte alive after the death of their musical and spiritual leader. It was agreed to invite Antonio Brosa, a Spanish concert violinist. His resume as a soloist was solid, and, having led his own quartet on a number of U.S. tours, he was more than qualified to lead the quartet. Brosa was offered the position without audition; he accepted. Just as Onnou never played a note on campus as a member of the “Pro Arte Quartet of the University of Wisconsin,” neither did cellist Robert Maas. He had recovered from his bout of actinomycosis by October, 1940, but acquiring exit documents from occupied Belgium proved all but impossible. When he finally arrived in the U.S., he found himself in a situation similar to today’s free agent superstars in sports. Instead of joining another quartet, Maas founded, along with Henri Temianka, the Paganini Quartet, which has been heralded as “a great quartet born on American soil.” Only Halleux (violin) and Prévost (viola) remained. After years of finely honed ensemble, the Pro Arte entered an era where they might as well have had a revolving door: no fewer than four cellists performed in Madison during the war (two of them leaving via the draft). By 1945, only Prévost remained of the original four Belgians—no one else had more than sixteen-months experience with the quartet. But from the beginning, the new “residents” of UW–Madison took the Wisconsin Idea seriously: they considered all of Wisconsin both student and audience. In addition to coaching the string section at UW–Madison, their schedule included weekly concerts on campus, a weekly radio broadcast for the Mutual Broadcasting Network, and performances throughout the state. Folks that had never heard of a string quartet, let alone a group that once held the title “Quartet to the Queen’s Court,” now savored Wisconsin’s unique treasure. In 1944 a key addition ended the Pro Arte’s upheaval and launched a new era of stability and, eventually, recognition for the group. Rudolf Kolisch, whose own quartet had appeared with the Pro Arte back in the early 1920s, was named first violinist. Under his leadership, the Pro Arte quickly made its mark, and a revival of critical recognition began in some old stomping grounds. Coolidge arranged for a memorial concert for Onnou at the Library of Congress (where she had donated funds for the construction of the Coolidge Auditorium for Chamber Music), and from there and in subsequent performances, the Quartet was favorably compared to the original Belgian personnel—some said it was even better. By 1950 the impact of the quartet’s residency could be measured by the number of imitators across the university landscape. Over the past twenty years there were the occasional and inevitable personnel changes and intermittent battles over exactly what their collective and individual responsibilities were on campus, but the Pro Arte Quartet persevered. In 1967 the Pro Arte had all American musicians for the first time, and it began a new period of stability. They resumed international appearances in the 1970s with three tours to Latin America and two to Europe. Joining the group in 1976, cellist Parry Karp is the link between the era that say the initial Belgian group rise to prominence and the present one: Karp was part of the Pro Arte ensemble when it was featured in a 1977 CBC television film about Germain Prévost. The two met, and, as a result of the meeting, the Pro Arte always visited Prévost in the San Francisco Bay area when they toured in California. As the great violist aged, they would arrange their chairs in a circle around him, often performing their entire tour repertoire for a most distinguished audience of one. Prévost passed away in San Francisco in 1986 at the age of 95. With the completion of the 2010–11 season, Karp is now the longest tenured member in the quartet’s history, and he anchors a group that has been intact for sixteen years. Violist Sally Chisholm joined the group in 1991, with second violinist Suzanne Beia and first violinist David Perry beginning their Pro Arte careers in 1995. It is worth noting that Perry had a stretch as concertmaster of the Orpheus Chamber Orchestra—a group noted for not performing with a conductor. Today he sees the work of the Pro Arte as more than vital than ever at the university level as well as in fulfilling the Wisconsin Idea—for the state and beyond. Indeed, as the first century of the ensemble comes to a close, it would seem that today’s Pro Arte Quartet has revived the reputation of the original Belgian group, and taken the Wisconsin Idea to an even higher plane. Last spring the Pro Arte returned to Carnegie Hall, and this season’s repertoire and activities celebrate the ensemble’s legacy of influence and pioneering spirit. Each work has a tie to the history of the group, but the heart of the season is four world premieres. Two were just given last fall, and are already recorded, with two to come in March and April of 2012. Guest lecturers are coming from all over the country and Europe, and in the fall of 2012 there will be a co-centennial celebration at Taliesin, the Spring Green home of architect Frank Lloyd Wright. And in their 2014-15 season, the Pro Arte Quartet returns to Belgium, at last. It’s likely the citizens of Wisconsin and those throughout the U.S. who have been touched but these virtuoso musicians will make it clear it’s just for a short visit. Greg Hettmansberger began his writing career as a freelance critic for the Los Angeles Times in 1988. Along with contributing to a number of southern California publications for the next 13 years, he spent a year on staff at Los Angeles Opera.